The green mango is basically unripe mango. 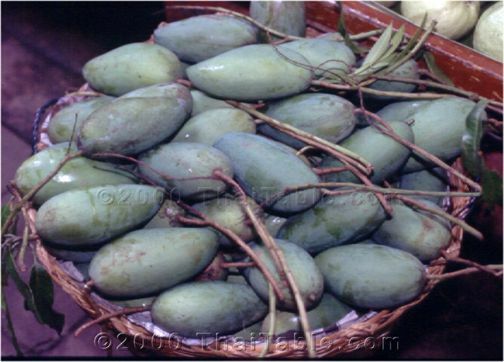 Green mango can be sour or nutty and sweet depending on the variety. The sour ones are used in the place of lime or in combination with lime in Thai dishes. An unripe mango is very hard when you touch it and does not give in like a ripe fruit. Depending on the variety, the unripened ones in Thailand are usually green, without yellow or red. However, the variety that are available here in the US are green, red and yellow in color. Green mangoes are available at some Asian stores. I usually find them at an Indian store. Make sure they're labeled green mangoes. Choose them by picking the hardest one. Use the green mango right away and always keep it in the refrigerator to prevent further ripening. In Thailand, there are more varieties and there are even some that are used exclusively when unripe. These varieties can be either very sour for cooking (e.g., geow) or are for eating and are a little sweet and floury and very crunchy (e.g., kiow sawoy).